Groaners are mostly one-liners that you either like or don't like instantly. However, some of them are quite long as you will see if you read down the page. Most weight lifters are biceptual! The moonshine artist excelled at "still life"! It started to rain and Noah said, "Now I herd everything!" A woman in ancient Rome enters a bar, holds up two fingers and orders five beers! I attended a really emotional wedding - even the cake was in tiers. I'd like to get a job cleaning mirrors - it's something I can really see myself doing. "My doctor tells me I suffer from extreme hypochondria. He prescribed a strong placebo, but I don't think it's working." A tax collector went to a tannery. "Why haven't you paid your taxes?" the collector asked the owner of the tannery. "Business has been very bad," answered the tanner. "Do you mind if I check around the place?" asked the tax man. "Go ahead," invited the owner. "You'll see I have nothing to hide." I'm not saying that the customer service in my bank is bad, but when I went in the other day and asked the clerk to check my balance...she leaned over and pushed me! "Jim, why is that sheep purple?" "Because I herded it through the grapevine!" What do you call a knight who is afraid to fight? Sir Render! An Asian fellow has moved in next door. He has traveled the world, tried swimming with sharks, wrestled bears and climbed the highest mountains. It came as no surprise to learn his name was Bindair Dundat. An auto club tow truck stopped beside me at a street light today and the driver was sobbing uncontrollably. I thought to myself, "that guy's headed for a breakdown!" What did the grape say when it got stepped on? Nothing - but it let out a little whine! My dad worked repairing roads for the city for twenty years before he got fired for stealing! At first I didn't believe it...but when I got home all the signs were there! Alcohol and calculus don't mix. Never drink and derive! When chemists die, do they barium? In which battle did Napoleon die? His last battle. Where was the Declaration of Independence signed? At the bottom of the page. The Talahatchie River flows in which state? Liquid. What is the main reason for divorce? Marriage. What can you never eat for breakfast? Lunch and Dinner. What looks like half an apple? The other half. If you throw a red stone into the blue sea what will it become? It will become wet. How can you lift an elephant with one hand? You will never find an elephant that has only one hand. How can you drop a raw egg onto a concrete floor without cracking it? Any way you want, concrete floors are very hard to crack! Did you hear about the self-help group for compulsive talkers? It's called On and On Anon. She was engaged to a man with a wooden leg, but broke it off! A Local Area Network in Australia is a LAN down under! Paddy says to Mick, "Christmas is on Friday this year". Mick says, "Let's hope it's not the 13th then." My friend just hired an Eastern European cleaner. It took her 5 hours to hoover the house. Turns out she was a Slovak! I've been charged with murder for killing a man with sandpaper. To be honest I only intended to rough him up a bit! Why are Cheetahs on the endangered species list? Because Cheetahs never prosper! And the best man says: "Sounds to me like she's been sweeping around!" A couple lived near the ocean and used to walk the beach a lot. One summer they noticed a girl who was at the beach almost every day.. She wasn't unusual, nor was the travel bag she carried, except for one thing; she would approach people who were sitting on the beach, glance around and then speak to them. He runs up to his door, fumbles with his keys, opens the door, rushes in, slams and locks the door behind him. However, the casket crashes through his door, with the lid of the casket clapping, clappity-BUMP...clappity-BUMP...clappity-BUMP...on his heels. The terrified man runs upstairs to the bathroom and locks himself in. His heart is pounding; his head is reeling; his breath is coming in sobbing gasps. With a loud CRASH the casket breaks down the door... Bumping and clapping toward him. 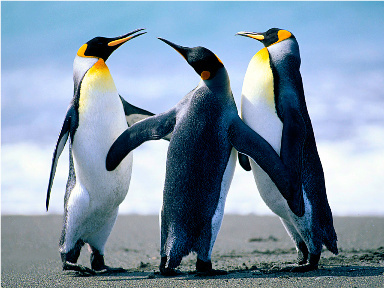 It is a known fact that the penguin is a very ritualistic bird which lives an extremely ordered and complex life. The penguin isvery committed to its family and will mate for life, as well as maintain a form of compassionate contact with its offspring throughout its life. If a penguin is found dead on the ice surface, other members of the family and social circle have been known to dig holes in the nearby snow, using their vestigial wings and beaks, until the hole is deep enough for the dead bird to be rolled into, and buried. You really didn't believe I know anything about penguins, did you? Not long ago there was a bit of a scandal in England when one of their fast food retailers owned by a company called Tesco, was caught selling "hamburgers" that contained 30% horse meat. Here are some groaners that sprouted from that mess. I'm so hungry, I could eat a horse...I guess Tesco just listened. Had some burgers from Tesco last night...I still have a bit between my teeth. A woman has been taken into hospital after eating horse meat burgers from Tesco. Her condition is said to be stable! To beef or not to beef. That is equestrian. The bagger says, "But I've been working here for five years. Why can't I run the juice machines?" The manager answers, "I'm sorry, son, but baggers can't be juicers." A mother was anxiously awaiting her daughter's plane. The daughter had just come back from a tropical island where she was trying to find love and adventure. As the daughter was exiting the plane, the mother noticed a man directly behind her. He was dressed in feathers with exotic markings all over his body and was carrying a shrunken head. The daughter introduced this man as her new husband. The mother gasped in disbelief and disappointment and screamed, "I said for you to marry a RICH doctor!" After a few minutes, a big tall cowboy walked in and said, "Who owns the big white horse outside?" The cowboy looked at the Lone Ranger and said, "I just thought you would like to know that your horse is just about dead outside." A few minutes later, another cowboy struts into the bar and asks,"Who owns that big white horse outside?" The cowboy says to him, "Nothing much, I just wanted you to know - you left your Injun running!" One night, the Potato family sat down to dinner - Mother Potato and her three daughters. Midway through the meal, the eldest daughter spoke up. "Mother Potato?" she said. "I have an announcement to make." "And what might that be?" asked Mother, seeing the obvious excitement in her eldest daughter's eyes. "A Russet!" replied Mother Potato with pride. "Oh, a Russet is a fine tater, a fine tater indeed!" "DAN RATHER?" Mother Potato scowled suddenly. "But he's just a common tater!" Two robins were sitting in a tree. "I'm famished," said the first one. They flew down to the ground and found a nice piece of plowed land with lots of fresh worms. They ate, and ate, and ate 'till they could eat no more. "I'm so full, I don't think I can fly up to the tree," said the first. "Me, either. Let's just lie here in the warm sun," said the first one. No sooner had they had fallen asleep when a big fat tomcat attacked and gobbled them up. As the cat sat washing his face after his meal, he thought, "I love Baskin' Robins." Don't miss any new Groaners that I put on this website. Send me your email address (below) and I'll keep you up-to-date automatically. I had a dream the other night. I was in the Old West riding in a stagecoach. Suddenly, a man riding a horse pulled up to the left side of the stagecoach, and a riderless horse pulled up on the right. The man leaned down, pulled open the door, and jumped off his horse into the stagecoach. Then he opened the other door and jumped onto the other horse. A blonde decided to have twelve clones made of herself at a clinic. When she went there, she found it was a bleak brick house without any windows. When she asked the clone arranger why there were no windows, she was told that, "people in glass houses shouldn't grow clones!" When the clones were growing up, she was never be allowed to take them out for a walk on her visits because she was told, "you'll never walk a clone." What disturbed her the most was that every time she would visit them, they all would be yelling at the top of their lungs. When she asked why they yelled so much, she was told that this was to be expected, as she had ordered a dozen I-scream clones! Walking through Chinatown, a tourist is fascinated with all the Chinese restaurants, shops, signs, and banners. He turns a corner and sees a building with the sign, "Hans Olaffsen's Laundry." "Hans Olaffsen?" he muses. "How in the world does that fit in here?" The tourist asks, "How did this place get a name like Hans Olaffsen's Laundry?" "Is simple," says the old man. "Many, many year ago when come to this country, was stand in line at Documentation Center. Man in front was big blonde Swede. Lady look at him and go, What your name?" "Then she look at me and go, What your name?" Far away in the tropical waters of the Coral Sea, two prawns were swimming around. One was called Justin and the other, Christian. Lo and behold, Justin instantly turned into a shark. Justin began to realize that his new menacing appearance was the cause of his sad plight. So, while swimming alone one day he saw the mysterious cod again and he thought perhaps the mysterious fish could change him back into a prawn. He approached the cod and begged to be changed back, and, lo and behold, he found himself turned back into a prawn! 'He's at home, still distraught that his best friend changed sides to the enemy and became a shark,' came the reply. As he opened the coral gate, fond memories came flooding back. After a visit to a "house of ill repute", a man notices green lumps on his willy, so he goes to the doctor. "That's serious" says the doctor. "You've heard that some wrestlers get cauliflower ears?" "Yes" says the man seriously. "Well" says the doctor "You've got brothel sprouts." A pizza delivery man hands a monk a pizza. The monk then pays for it with a $20 bill. As the delivery man starts to walk away, the Buddhist then says, Where's my change?" The delivery man replies, "Change comes from within." Another climber heroically came to his rescue and just managed to grab Johann by a strap of his liederhosen to save the Maestro's life. Since then, the act of trying to get out of a seemingly hopeless situation has come to be known as grasping at Strauss! A bill collector knocked on the door of a country debtor and asked the woman who answered the door, "Is Fred home?" She wanted to give him the feeling that he had some independence but yet know that he was safe. So, she had an idea of how to handle it. She asked a neighbor if she would please follow him to school in the mornings, staying at a distance, so he probably wouldn't notice her. She said that since she was up early with her own two kids anyway, it would be a good way for them to get some exercise as well, so she agreed. The next school day, the neighbor and her little girl set out following behind Timmy as he walked to school with another neighbor girl he knew. She did this for the whole week. As the two walked and chatted, kicking stones and twigs, Timmy's little friend noticed the same lady was following them as she seemed to do every day all week. Finally she said to Timmy, "Have you noticed that lady following us to school all week? Do you know her?" The little girl said, "Well, who is she?" "Shirley Goodnest? Who is she and why is she following us?" "Well," Timmy explained, "every night my Mom makes me say the 23rd Psalm with my prayers, 'cuz she worries about me so much. And in the Psalm, it says, 'Shirley Goodnest and Marcy shall follow me all the days of my life', so I guess I'll just have to get used to it!" Botanist Roy Noble had always dreamt of ending world hunger. After years of research, his hard work paid off. He developed a strain of peas that would grow virtually anywhere. It grew fast, kept long without spoiling, and was more nutritious than even soybeans. He was an instant hero,world wide. There were awards and parades, and naturally the new strain of peas was named Noble. After enjoying the fame and fortune for a while, Roy decided he wanted to do more, so he established a fund to award a monetary prize each year to botanists and horticulturists who were making significant contributions to their fields. Thus was born the famous Noble Peas Prize. The Government found about 200 dead crows near a major city last fall, and there was concern that they may have died from Avian Flu. They hired a Bird Pathologist to examine the remains of all the crows, and he confirmed that the test results showed it was definitely NOT Avian Flu, to everyone's relief. However, he determined that 98% of the crows had been killed by impact with trucks, and only 2% were killed by car impact. The province then hired an Ornithological Behaviourist to determine why there was a disproportionate percentage for truck versus car kills. The Ornithological Behaviourist determined the cause in short order. He concluded that when crows eat road kill, they always set-up a look-out crow in a nearby tree to warn of impending danger. His conclusion was that the lookout crow could warn the other crows by saying "Caw! Caw! ", but the crow could not say "Truck!" Jorge Mario Bergoglio was not the Cardinals’ first choice to be the new pope, and to become Pope Francis. Their first choice was, interestingly, Cardinal Hans Grapje. An exciting new development in marine biology promised to extend the lifespan of an endangered species of porpoise. In fact, the data suggested that if a specific kind of African seagull, freshly out of the egg, was fed to the porpoises every day without fail, they would actually live forever! The big challenge was to gather this food supply, this equivalent of chicken dinners for oceanic mammals, on a regular basis. There were many problems, including the fact that it could be dangerous, as these seagulls were found near water holes where all sorts of large game animals congregated. But this was an important ecological breakthrough, so teams were sent out right away. They worked diligently to supply the necessary small fowl. One afternoon, an intrepid gull-gatherer on his way back to base from the water hole encountered a pride of lions taking their afternoon nap. As they were blocking his way, and his day's catch of seagull hatchlings was needed right away, he carefully stepped over the lions that were directly in his path. That spelled the end of the experiment. The porpoises, deprived of their special diet, not only did not live forever, but they also became extinct. transporting young gulls across sedate lions for immortal porpoises. Do you want to comment on any of the Groaners OR do you have a Groaner of your own? Use this form to comment on the Groaners above or to send me one of your own. If you send me a Groaner and I use it, I'll give you credit for it. Submitting is easy to do. Just type here! Do you have some pictures or graphics to add? (Most people don't.) Click the button and find the first one on your computer. Select it and click on the button to choose it. To check out my Punny Puns page, click above. There you will find yuks similar to these Groaners. Go back to Fun Jokes for lots of other different and unique jokes.